For a while now I am trying to figure out the answer to one question that was on my mind. I noticed that some Vintage Citizen Watches have orange accents on their dials and I also found the same model but instead of the aforementioned orange they had yellow. Why is that? Are they different after all or a mistake, or repainted, or…? The watch that gave me the chance to answer the riddle is the super rare Dandy Seven diver. I am lucky enough to have a NOS (that I will never sell) one. (read about this awesome model HERE) A few days ago I got another one, also NOS, with the sticker on the back and in excellent condition. BUT… it had a yellow ring on the dial, not the orange. How come? Both are NOS and they have not been tempered with in any way in all the 50 years that passed since they were made. So… I had to follow my hunch. I opened the yellow one and hoped I will see some parts of the yellow hidden under the case but it was not like this. All the colored part of the dial is visible through the acrylic crystal. I took my magnification and there it was, the answer I was looking for and hoped for – The orange dot! 🙂 Hidden on the dial plate side, right where the date window is, sat a tiny dot of paint. And it was not yellow, it was orange! So… where does this discovery take us? It is easy to understand that at a certain moment in time, when the watch was made, the present day yellow was in fact orange to start with. So, without a shadow of doubt, due to UV light, the orange turned into yellow. It is in fact the same model. The orange one sat in the dark, the yellow one sat in the light. And I am pretty confident that this is true to all the other orange – yellow Vintage Citizen Watches models out there. 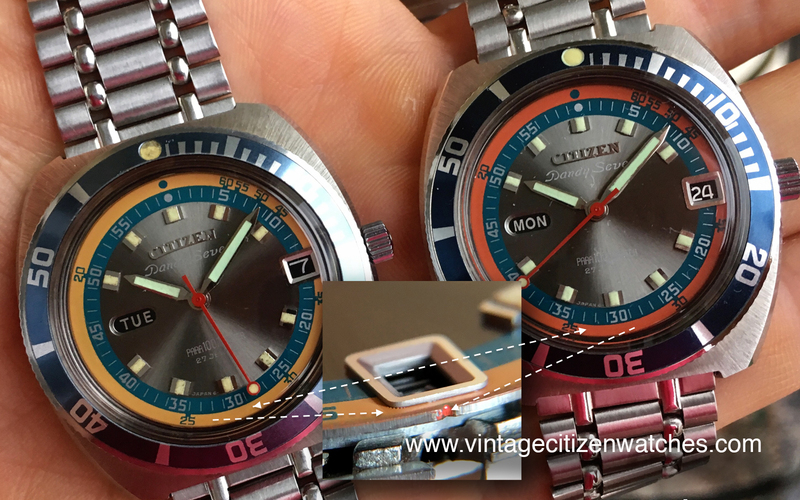 Read more about patina in Vintage Citizen Watches HERE.